The intrinsic efficiency of grids is a huge reason to be optimistic about cities that have arterial streets or potential transit corridors laid out in a grid pattern, especially if they have many major destinations scattered all over the city. If your city or a part of it looks like that, you have a huge structural advantage in evolving into a transit metropolis. Los Angeles and Vancouver are two of the most perfect transit cities I’ve seen, in their underlying geography, because they have these features. More on this aspect of both cities shortly. Note that the grid works because people can walk to both a north-south and an east-west line. For this reason, cities or districts with labyrinthine local street patterns that obstruct pedestrians (Las Vegas, most of Phoenix, much of suburban Southern California) will have a harder time becoming transit-friendly even though they have a grid pattern of major arterial streets; pedestrians can’t get out to the grid arterials easily or cross them safely. Grids are so powerful that dense cities that lack a grid network of streets often still try to create a grid network of transit. Gaze for a bit at a schematic map of the Paris Métro and its underlying grid pattern will start to emerge. Most lines flow pretty consistently either north-south or east-west across the city. While they can’t remain entirely parallel or evenly spaced as they snake through this city of obstacles, you can see that, on some level, they’re trying to. Or look at San Francisco. The basic shape of the city is a square about seven miles on a side, with downtown in the northeast corner. Because downtown is a huge transit destination, there are many routes from all parts of the city converging on it in a classic radial pattern. But under the surface, there’s also a grid. San Francisco’s [old] published network map is too complicated to reveal it easily, but you can see the grid if you look at a few schematics of individual routes. For example, Lines 23-Monterey and 48-Quintara 24th St are east-west elements. Notice how these two lines remain largely parallel as they cross the city. This is interesting because San Francisco’s street network has a lot of small grids but no prevailing citywide grid. In fact, a major ridgeline runs north-south through the geographic center of the city. The arterial network is very un-gridlike as it follows the steep terrain. As a result, these lines have to twist a bit to get over it using the available streets. The 48 has to twist again to get over Potrero Hill on the east edge of the city, where there is no available east-west street. Yet they keep trying. Why aren’t all frequent networks grids? The competing impulse is the radial network impulse, which says: “We have one downtown. Everyone is going there, so just run everything to there.” Most networks start out radial, but some later transition to more of a grid form, often with compromises in which a grid pattern of routes is distorted around downtown so that many parallel routes converge there. You can see this pattern in many cities, Portland for example. Many of the lines extending north and east out of the city center form elements of a grid, but converge on the downtown. Many other major routes (numbered in the 70s in Portland’s system) do not go downtown, but instead complete the grid pattern. This balance between grid and radial patterns was carefully constructed in 1982, replacing an old network in which almost all routes went downtown. 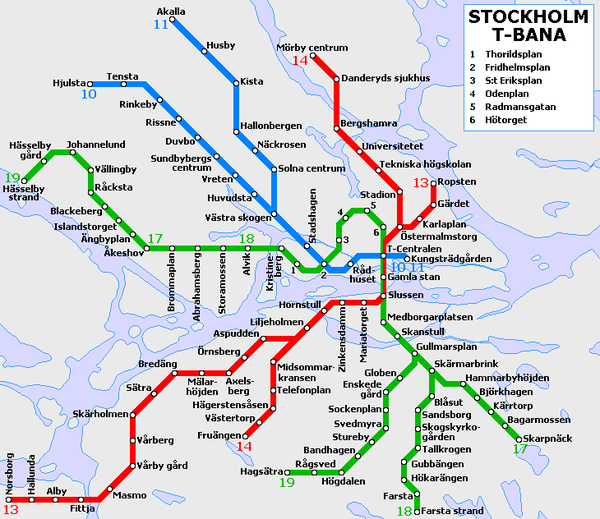 As a point of contrast I would say that Stockholm’s Subway systems is in some ways a “perfect” radial network with all subway lines converging at T-Centralen. The subway system hasn’t seen major expansion since the 70’s and all current and future BRT and light rail plans are circumferential in nature connect the subway lines either on the edge of the inner city or a bit further out. See the link below. Another side note about route structure via Vuchic and the map of Portland you included. L and U shaped transit lines are other commonly used route shapes. In Portland the 72 is example of L route and the 71 is an example of a U shaped route. These shapes combined with straight through routed lines are very effective at creating “ubiquitous networks” which look more like a grid than a radial system although they aren’t exactly the same as a grid. Just one more way to look at all this. The spider or radial grid has an important theoretical problem, and that is its obvious interference with wandering, non-radial processes or developments. It casts into stone what part of the city will get disproportionately great transport connectivity. Thus it interferes with future, otherwise natural fluctuations in what would be areas of concentrated activity. Radial grids are a tiny bit like inherited wealth, where the center of the grid forever and unnecessarily inherits the transport wealth, even if future parts of the city might otherwise better deserve or earn better service. Another way of discussing the overall topic is to point out that cities, in the case of well-funded, completed networks like paved roads, just throw transport links everywhere in overwhelmingly rectangular, finely-spaced grids. We don’t pave a few radial roads with circular connectors in downtown areas (leaving bizarre suburban dead-end streets as a special recent case), it doesn’t even occur to us to do that when we have enough money and willpower to build a serious downtown network. Only public transport in car-centric cities gets the starvation treatment, where we debate at great length whether our child will thrive best with scurvy (Vitamin C deficiency), or simple protein/calorie malnutrition. I immediately ponder another system, which is the multi-nodal system, commonly used by more sprawling, less downtown-oriented cities, probably to get the most out of an under-funded bus system. Omaha http://www.metroareatransit.com/pdf/SystemMap_12-09.pdf and Hampton Roads (Norfolk/VA Beach/Newport News) http://www.gohrt.com/maps/sys-maps/southside-map.pdf AND http://www.gohrt.com/maps/sys-maps/pnsula-map.pdf come to mind. These systems use strategies like pulsing and timed transfers to provide more frequent service than would be possible without transfer stations. Is this an appropriate solution for these types of cities? I’d also point out that the Parisian bus system is EXCELLENT without a square grid, because street networks with built-in destinations (places, squares) offer natural and prestigeous transfer points, and not just a street corner somewhere. My own view — and I am curious to know if you agree or not — is whether the grid must be literally so: must “the grid” be perfectly rectangular? Is it composed of 90 degree angles? etc etc. More importantly, I think that the concept of “gridness” should also be understood more as “continuity” than as boxes. Of course the grid is more practical and easier to design/build and works just fine in terms of property transfer etc etc — we have wonderful cities with just grids so why gild the lily? But I think that it is important both politically and intellectually-correct to allow the “eccentric grid” which can allow surprise etc etc. And after all, from a transportation POV, what we care about is not rectangles and 90 degree corners but multiple paths. The grid functions to allow redundant routes and the rectilinearity is just a means, though a very simple one and simplicity is usually good. Or do I miss something? Your perspective? Agreed. There is NO pleasure at all in moving across a grid, whether walking, cycling, driving, or taking a bus. Pleasure is arrived from reaching points on a route, landmarks, places. It is for this reason that grids are so soul-crushing. There is no light at the end of the tunnel, no destination. The only truly enjoyable street in New York City is Broadway, and then only from 96th to 14th, because you reach places along it. Columbus Square, Times Square, Madison Square, Union Square. The pleasure of reaching each of these points on the journey is indescribable. The rectilinear grid is purely a development tool, and is not designed for pleasure or beauty. The Parisian Metro is NOT a grid as described by you. It is a multinodal eccentric grid. Buses and trains meet in these great intersection/places, and this is where correspondances take place. In Portland, 2 buses cross on the grid at a single point, but in Paris it may be 6 or 8 transit services. Riders may wait in these grand places together though for different directions and destinations. And they may take a taxi too, because there is such a critical mass of activity. Transit services can concentrate on the experience in these places, which are fewer in number than if the transfer points were strung out along a line. The difference cannot be overlooked. David makes a great point. Grid layouts like Toronto and Portland are boring. Yes they are efficient but that shouldn’t be the only goal. We should avoid a false dichotomy between grids and cul-de-sacs. Part of the pleasure of walking is in stumbling upon strange streets, hidden alleyways, and losing your sense of direction to become immersed in the city. Grids may make a transit planner’s life easier, but they’re kind of dull. I agree completely with David Sucher that if we’re talking about urban form, interruptions to the grid tend to be places of particular interest and delight. If those are successful places, they will generate more concentrated transit demand and thus justify distortions in a grid transit network to serve them. But one of the (possibly futile) purposes of this blog is to encourage urbanists to be aware of the underlying geometry and economics of transit, so that they at least see the efficiency costs of their urbanist ideas. For multi-destinational areas, the standard grid is the answer to a specific question about what makes the most efficient network — i.e. the highest mobility at the lowest cost. Obviously, real world grids are all variations on this theme. Sometimes, as in the Paris Metro, the variation is extreme, such that you have to stare at the map for a bit to see the underlying grid pattern. Obviously too, uniform eternally replicated grids are boring. But grids dominate the human geography of central and western North America, for example, because they are such efficient structures for organizing space (for land development and roads, for example, not just transit). My purpose here is to encourage you to understand this important geometric point, so that when you proceed to the aesthetic point, you understand the efficiency costs of the aesthetic you prefer. There’s a tendency among urbanists to react strongly to any explanation of transit geometry and immediately shift the discussion to aesthetics, as though efficiency in transit is so comprehensively unimportant that merely to mention it is evidence of some kind of blinkered “engineering” world view. This move can mask the urbanist’s ignorance and disinterest about the basics of transit efficiency. It’s as though an architect refused to learn anything about structural engineering because it got in the way of his ideal notions of what makes a satisfying building. Bottom line: if efficient transit (lower costs, more mobility) is important to you, it’s important to understand how standard grids deliver that outcome in a multi-destinational city. This is a geometric fact, and it exists regardless of your aesthetic preferences, or mine. When you face a real-world city armed with that geometric knowledge, you’ll see opportunities and issues that a more transit-ignorant urbanist will miss. Perfect grids are incredibly boring, but yes, very efficient. North and South Philly go on and on with endless blocks of rowhouses (many empty, unfortunately). Contrast that with what I would call the perfect combination of grid and “surprise” diagonals — Washington DC, which features wonderful circles and squares, bringing the grid to life. Both are well served by transit. An unconstrained grid is perhaps the worst form of street organization in a lot of circumstance. It maximizes the amount of paved area, it maximized the number of dangerous intersections for motorists, cyclists and pedestrians and as other people have mentioned, it is often brutally boring. With so many intersections requiring vehicles to start and stop all the time, it also maximizes GHG emissions. An unconstrained grid also offers no advantage in travel time for cycling and walking. In residential areas, it is very child unfriendly. With through traffic on every street, children can’t play or cycle in the streets. The through traffic on every street also makes an unconstrained grid very poor for cycling, In Vancouver, we have spent tens of millions of dollars on traffic calming to try and tame the grid with mixed results so far. There is often great resistance to street closures. Especially in residential areas with small block sizes, almost all the surface becomes covered with asphalt or buildings. East Clayton in Surrey is a great example of this. The front yards are very small and the back yards are dominated by garages there is very little open space in the back yard to play in. The alleys are paved to the garages and there is no green space. The only place where it works are the few houses that front parks or trails. The brand new streets have had cement barriers placed in them to stop speeding traffic and give children some place to play. It is possible to fix the grid by street closures and traffic diversions as was done in Vancouver’s Westend. This makes walking and cycling much more convenient than driving. An even better model for neighbourhoods is to place the parking and automobile access at the edge of the community and have the heart of the community carefree as is done in some communities in Europe. 3) Infill with community service lines. #1 applies to most of the rail lines (Metro and cable cars) plus various services that terminate near the Ferry Bldg. or the soon to be gone Transbay Terminal. The southern extensions from the Embarcadero Stn. are useful anomalies. #2 is interesting due to the titan of non-downtown service – the #28-19th Ave. and the several boomerangs (#29-Sunset, #44-O’Shaughnessy, #24-Divisadero, #33-Stanyan, F-Market). The route planners have managed to combine the best elements of a radial system with a grid. Take the #38-Geary as it heads out west on Geary St. for the Richmond District. It crosses the #30-Stockton (S. to Caltrain), the Powell St, cable cars, the Polk/Van Ness Corridor, #22-Fillmore, #24-Divisadero, #43-Masonic, and the #33-Stanyan before entering the Richmond Dist. Also, most lines are kinked either due to terrain (e.g. Twin Peaks in the center) or a community node (hospital, school, etc.). Some of the kinks are due to the yen-symbol made by the Market St. crossbar. If a line seems peculiar (e.g. #47-Van Ness) take a look at what it connects (Fisherman’s Wharf, City Hall, Caltrain). It’s crazy, but one gets used to it after a few years. P.S. In answer to David Sucher’s comment SFMuni’s planners seem to have blended legacy lines with modern efficiency to get a network that is both efficient and loaded with eye candy. Try taking a #44-O’Shaughnessy north to 6th Ave.+ California from Silver and Mission. There are built-up sections with various green zones mixed in. Whether you’re into architecture, greenery, shopping (non-mall ! ), or museums there’s something on the way for you. This variety that all too often I take for granted keeps the city lively and engaging. Jarrett, I appreciate your point. This is a blog for planners who are working in a street network that is established. I guess I missed that in my zeal. But again I bring up mid-sized Omaha. It is a grid, with a few diagonals. But it is a system with Transfer Centers, typically at destinations such as malls. What is your take on this new less-than-urban transit amenity? Should frequent grid-lines have tails that bring them together? Given a large urban area with a relatively flat population distribution, as in most large cities in the southern and western U.S., a grid may be the most efficient way to lay out major transit routes, but that doesn’t mean transit could ever realistically be competitive with cars in urban areas of that kind. The fundamental problem for transit in such places is not the layout of routes but the need to serve so many destinations because of the spatial distribution of the population. Even for an idealized grid, allowing transit users to travel between any two addresses with at most a single transfer, and with very frequent service on all routes to minimize wait times, the vast majority of trips will still probably be significantly faster by car than by transit. The need for so many routes means the system will be overwhelmingly dominated by buses, because it’s far too expensive to build rail transit along every grid line. And the need for so many stops means the buses will be slow. Los Angeles is a clear illustration. It has almost 200 bus routes with almost 20,000 bus stops, but only 5 rail routes and about 100 rail stations. @ Richard. If by “unconstrained grid” you mean “grid of car-oriented streets” I agree. But the creation of preferences for transit and bikes, and obstructions for cars, is a separate question from overall network geometry. I think Vancouver has done pretty well with its backstreet network of bike boulevards and its West End street obstruction system, and a bit less well at protecting its grid transit network from traffic. But the grid is still a logical geography for the transit network. @ Louis Haywood. Grid structures require high frequency, generally 15 minutes or better all day. Small or low-density cities and areas that can’t afford high frequency have to do timed-transfer instead. In that case, a grid street network doesn’t particularly help you. I’ll do another post on that soon. @ Watson. Transit’s ability to compete with cars depends on overall density and the disincentives to driving that result. The point I’m making here about grids applies in central Manhattan as well as in LA, but of course the overall intensity and quality of service will vary with density, and at lower densities than LA, transit grids fail to function well and you end up going to radial timed-transfer structures, as Louis Haywood notes. Watson is right. The problem with grids is they are even more efficient for cars than for transit. If I were to construct my fantasy city, it would have lots of narrow, weird streets jutting off at odd angles from each other, with no curves in them. There would be NO thoroughfares. But there would be elevated ALRT zooming overhead really fast. The dense web of odd-angled streets would make walking and cycling a pleasure, the urban experience a joy, and driving unbelievably frustrating. The elevated ALRT would have a massive advantage over cars for long trips, and it strikes me that the elimination of drivers and their unions would make this transit system even more economically efficient than buses serving a grid. Bottom line: grids are even better for cars than for transit. And they are boring. Pantheon. No, the structure of the network is a different issue from whether the elements of the network are optimized for cars vs transit. Two different issues. One of the most perfect high-density grid cities in the world is Chicago. Bus lines run for miles in either a north-south or east-west direction. If you look at the rapid transit system (CTA) or the suburban train system (Metra), however, you will find a radial system with all spokes heading into and out of the central business district. And yes, the grid and radial meet at many locations so you can move (slowly) in the grid and (rapidly) in the radial. Ideal? Yes, if you don’t count the amount of time it takes to catch a bus to the radial, ride the radial, then take a bus along the grid to your destination. I frankly find other examples cited here absurd. San Francisco may have a grid street system but much of it was imposed on a topology that should have dictated something else. The Paris metro is largely a cut and fill subway following existing street pattern and only the RER which is a deep dig network follows any kind of grid and radial. Denver, Phoenix, Salt Lake City have wonderful grids of streets but not the population density to support a cost-effective large-scale public transportation system. The only other city that I am familiar with is Sydney and with its two CBD centers, it tends to be of a radial design converging on the City and North Sydney. @observer The Paris Metro, and the bus, is indeed a multi-nodal grid system. Many Metro lines do not enter the centre-ville. The RER is radial for all intents and purposes. @Jarrett, in general that is what I’m getting at, fine grained “grids” for bikes and peds with transit operating in a grid like manner. However, the grid doesn’t have to be composed of entirely straight lines and it is great to break it up once and a while. Twists, turns, squares and parks definitely add to a city. I’ve noticed how some rail advocates are almost do or dies about that radial scheme…to the extent that they almost seem to think that the city breaks down if there are too many centers in it with too many options for connections between. These kind of arguments betray an assumption that multi-polarity is just wrong, and in fact, harmful for cities. Nothing could be further from that fact. Another thing I’ve noticed is how some rail transit people are almost oblivious of the need to travel laterally in a city. Buses, for example, effectively do not exist in their hub and spoke view of the world… or they are just not a relevant part of the system. Folks, Jarrett’s point, I think, is that there is an aesthetic in logic. The aesthetic of logic is also a teacher and can be employed to create richer environments. We can certainly employ larger patterns and the logic of networks to even create, yes even, beautiful, crooked and whimsical streets…far from boring, messy environments that are nonetheless part of the synthesized, multi-polar, and always changing organisms that are our cities (which, boring or not, always have their own quirks and peculiar beauty and rich identities). When I first visited Manhattan, I didn’t immediately notice how easy the grid made walking. But I ended up walking far greater distances than I’d be comfortable walking in the cities I’d lived in at the time, Tel Aviv and Singapore. Singapore has a grid in the CBD, but anywhere else it’s cul-de-sacs. The part of Tel Aviv I lived in has an interrupted grid, with a few throughfares of a few kilometers and a lot of short streets. In both cities, a person would be completely stumped walking more than a kilometer away from his comfort zone. The distances I routinely walk today in a perfect grid scared me when I could get lost. Some of the anti-grid comments here make me wonder whether the people making them have spent any time in New York or Philadelphia or any other city where grids work. In fact, in New York the grid used to work in favor of transit, making it much easier to construct subway lines. London and Paris had to dig out lines by hand with platforms that didn’t always align; in New York the job was easier, and there was enough street width for four tracks. @Louis: Paris is the “centre-ville” of a megapolis. When you state that “many line don’t enter the centre ville” it strikes me has absurd. If you want to be more precise I think that Paris hyper-centre is located inside the loop formed by the M2 and M6. @Alon: as far as walking is concerned I find grid patterns horrendous. I remember quite vividly my time in New York. If you want to cross town by foot and go, for exemple, from south-east to north-west Manhattan you can do it by an awfull lot of different ways. You can simply go straight untill you reach the street or the avenue your goal is located. Or, you can follow the flow, turn when you get stopped by a red light. Prety easy but not very efficient. You need to multiply distance. On the opposite, cities wihtout a perfect grid street pattern (like Paris or Berlin…) give you less direct routes to go from one point to an another. In fact, you usually just have one but it’s mighty efficient because it links city nods the most direct way possible. Problem is, if you don’t know the local geography you will be lost because there is no apparent schematic to the street layout. @the Grid debate: So, in my opinion, transit lines should do exactly the same as what Paris Metropolitain (or even New York subway) does, it should follow a multinodal grid pattern. A thing more or less impossible to achieve with surface transit lines in a grid like street environment. The grid as an ideal pattern for achieving the network effect and several variations of this concept are presented very nicely in the network planning guide from the HiTrans project (www.hitrans.org). I get the feeling that Jarrett would like this book, which also illustrates many other basic network planning concepts well. I certainly do. Unfortunately it is quite hard to get as orders are handled by a small municipality in Norway, payment is by bank transfer in Norwegian crowns only and processing takes ages. They do have some sample pages on the website though, so I recommend at least taking a look at those. Yes, I've seen the Hitrans book and am an admirer of its lead author, Gustav Nielssen of Norway. I should add that nothing in this post is especially original. 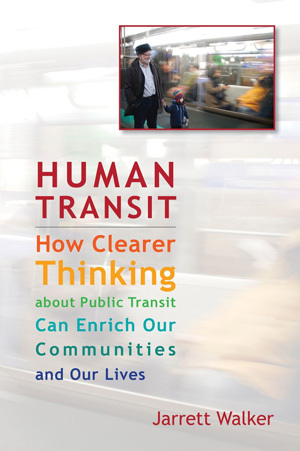 You can find it in textbooks, But unfortunately it appears mostly in specialist literature not read by the general public, or even by most urbanist professions. @samussas: Whether Paris is the centre-ville or not doesn’t really matter because the Metro network only serves Paris and a few inner suburbs. The fact that lines like the 2, 5, 6, 12, and 13 almost never penetrate the first six arrondissements is significant, and is what I meant by the system being very much not-radial; whereas the RER is very much radial, except for the RER-C, which has one non-radial tail. I’m not all that convinced that a square (i.e. 90°) grid makes for an ideal transport network, for any mode (for an absurd example, imagine if planes or ships had to travel on such a grid). Diagonal trips (including those that don’t go through the centre) become tedious affairs. That’s one of the reasons that diagonals have often been cut into pure square grid systems and often become the important axes of activity. Some of the plans for the improvement of Ottawa as a capital from about a century ago included the introduction of diagonal streets for just this purpose (unfortunately the First World War intervened). It’s amusing to see Portland’s major off-grid boulevards cited as “distorting” features. They’re “distorting” because they’re imperfect solutions to the problems posed by a square grid system in the first place. A more interesting network structure would be one based on hexagons or hexagons and equilateral triangles. The latter allows for thoroughfares in straight lines, but uses up more land to do it (and would give the average rectilinear-obsessed North American traffic engineer a fit with its skewed intersections). A pure hexagon-based system doesn’t allow for any long distance straight travel so “in practice” it would likely see a number of the hexagonal blocks cut in two to create straight lines, especially for transit. Except at a neighbourhood level, such a grid probably isn’t too practical, although with all the curves that our traffic engineers seem to like putting into even arterials these days and their intersections’ inherent reduced-collision risk and severity thereof (they’re naturals for roundabouts), they might be more practical than I think. However, the hexagon+eq.triangle grid has all of the connectivity of a traditional square grid but with a built-in ease of diagonal (and circumferential) travel. It also allows for radial travel without actually being per se designed for it, as in the spiderweb network. Such a network allows for a primary focus without being beholden to it in the long term, which is a combination that neither the square grid nor the spiderweb can duplicate in their “pure” forms. In a post all about creating an ideal network for a dense city with multiple activity centres with a goal of wanting “people to be able to travel from literally anywhere to anywhere else by a reasonably direct path, at a high frequency”, it’s surprising to see the solution proposed be one that is essentially brain-dead and fraught with problems that were recognized well over a century ago – the square grid is what we (especially those with a regimental mindset) do because it’s easy and doesn’t require much thought, kind of like our counting system (base ten makes no mathematical sense – we just do it because we have ten digits on our two hands; eight or better still twelve would be far better numbers upon which to base a counting system). One would imagine that the most central transit lines would be rail-based (converging around a central triangle or hexagon+3 triangles – i.e. also a triangle) and in time as the city developed other rail-based lines would be introduced in parallel but further out. The presence of 120° corners also allows for relatively easy rerouting of rail lines off of pure straight lines to hit other important destinations, something not nearly as easily done with a pure square grid (and what’s good for rail is usually good for buses too, for all the BRT obsessives about). Such a network would also lead to the creation of a bunch of roughly triangular or cylindrical buildings and opportunities for public “squares” (really triangles)… much more visual interest one would suspect than the boxes one gets with a square grid. So it seems this post had a pre-conceived idea of what was ideal without actually giving much thought to it… and remember, it was all about imagining an ideal, not about trying to fit in with what already exists. 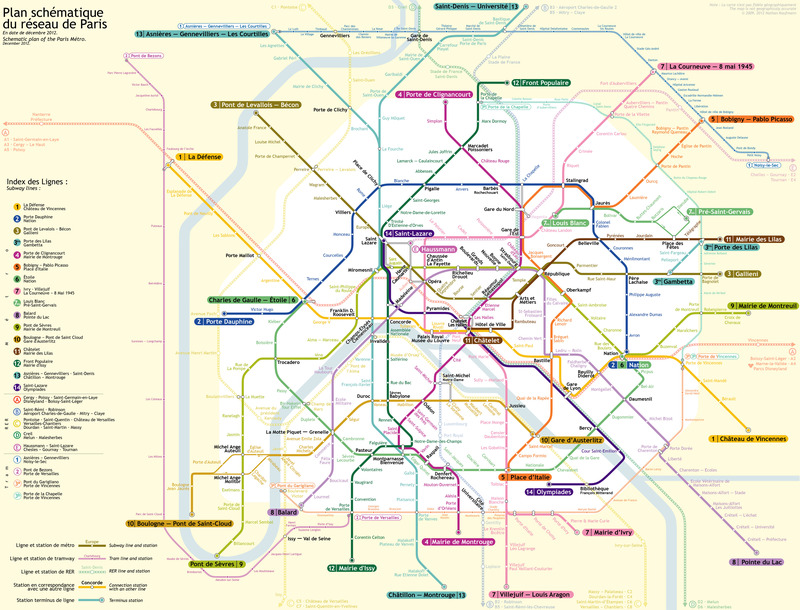 @Louis: As a matter of fact Paris Metro is both, it’s a grid and a radial system. The grid disapear more or less once you get out of the ring created by the M2/M6. The arrondissements around this ring are still more or less concidered has being “provincial”, out of Paris center. The fact is, they are out of the way. Not very well connected to the rest of the city, of the megapole. This gets even worse once you cross the “périphérique” and are not anymore in “Paris” proper. There, the Metropolitain (lines 1, 2, 5, 7, 8, 9, 10, 12, 13) is totally radial. It doesn’t connect to anything except else at La Défense. Hopefully this will change in the near future with the new Metro ring being planed and the diverse other projects (lines 1, 4, 11, 12, 14). And if lines 2 and 6 don’t penetrate into the first arrondissements it’s mostly because they are not radials but orbitals. They don’t serve the same purpose as the other lines. The line 5 don’t penetrate into those arrondissements because it doesn’t need to. It connects important anchors (Gare du Nord, Gare de l’Est, République, Bastille, Gare d’Austerlitz, Place d’Italie) one to another. Places that, if not located in the six first arrondissements, are, and were, of primary importance to the city. The line 13 was built as a way to alleviate congestion on line 12 and has help avoiding building a RER line between St-Lazare and Montparnasse. However, the hexagon+eq.triangle grid has all of the connectivity of a traditional square grid but with a built-in ease of diagonal (and circumferential) travel. It also allows for radial travel without actually being per se designed for it, as in the spiderweb network. The triangular grid has all the issue of a rectangular grid. It only allows travel in three directions; this may look better than a rectangular grid, but the problem is that off-direction travel is more circuitous. Another problem is that the intersections take too much space and have a lot of conflicts; each crossing only gets one third of the cycle instead of one half, which slows down both pedestrian and road traffic. The visual interest angle can be done with any grid. Every grid will have interruptions, leading to weird buildings. At any case, nowadays creating opportunities for visual interest only creates opportunities for starchitect-designed glass monstrosities. Problem is, if you don’t know the local geography you will be lost because there is no apparent schematic to the street layout. Yes, that’s what I was talking about when I brought up Tel Aviv. And Tel Aviv does at least set most of its street in an east-west or north-south direction, and has something like a grid of main streets. The problem is that the streets are so short and irregular (see here) that you’re limited to a radius of about 1 km from where you live and work. I’m adding my vote to the pro-grid crowd based on my home town of Melbourne. The downtown area is as square a grid as you can get. The main roads are spaced at about 220m with frequent tram service. Between the main roads are smaller laneways and arcades. The smaller lanes provide a sheltered space for the rich subculture Melbourne is famous for. The city is anything but boring and just got rated 3rd in the Economist Intelligence Unit Liveability Rankings. There are delights and surprises everywhere in Melbourne. Hunt down the streetfilms episode for an idea. While this is a small scale example, the point I would make is that a grid doesn’t have to be boring. The grid Jarrett is talking about has a spacing of 800-1000m, which is far larger than typical block spacing. It is an arterial grid network for transit and overall connectivity, and an urban landscape require many more streets than just those. And there’s all kinds of variation possible for the street pattern inside the blocks that still makes it easy to reach that arterial grid. Throwing in some diagonal boulevards — not necessarily to a “downtown” — can add interest to the overall network. This kind of structure is good not just for predictable, high-frequency transit, but also for wayfinding and knowing where you are in a city. It’s good to be able to get a bit lost in a city (and the right within-block patterns can do this), but for that to be a condition you can remedy if you so choose. I wonder what are your thoughts about the triangle grid David has suggested, specifically as means for organising transit lines and intersections (not for the organisation of all city blocks, and not necessarily a very strict 60 degree grid either). I have thought of a few drawbacks, but the idea is still charming. 1. More lines are required to cover the same area, unless compromises are made about distances between lines (which might perhaps make sense as the size of area enclosed by a triangles is smaller given the same spacing). 2. For one transfer trips that go the shortest way, you might not always be able to arrive at the street you need even if it’s served by a line. Perhaps it’s not that bad since you can still get off at the station closest to your destination, even if there is a station that’s even closer. 3. While in a rectangular grid spacing of lines doesn’t have to be strictly equal, in a triangular grid changing the spacing means the lines no longer meet at the same points, which might be a problem if we want alltransit connections have as many choises as possible. you might be interested in looking at the gangnam section of Seoul. They have a two level system. There’s a grid of alleyways inside a larger block bounded by massive roads with BRT in the middle and subways underneath. In the kangnam area, almost every road has a subway under it. (please ignore the ‘*’ – they exist only to make the vertical lines go in the proper place). The grid’s approach to this trip would be to walk to A, then take a bus to B, then take another bus to C, then walk to the end. However, since each bus segment is so short, even with frequent service, the waiting time still becomes a huge deal. The average 40 minute travel time is just 3.75 miles per hour, equivalent to a brisk walk, while the worst-case travel time is a mere 2.5 miles per hour, equivalent to a slow walk. With the slow speeds and huge travel-time uncertainty in the above calculations, before you even consider the possibility of bunching leading to 20-30 minute waits, if the goal is simply to get to the destination quickly and reliably, transit can’t even compete with walking, let along with driving. This relegates the use of transit for these trips to people can’t walk or bike and also can’t afford to drive or spend $10 on a taxi ride. Trips like these are not edge cases and I make trips like this quite frequently. Usually, I end up either biking or jogging the entire way or walking half way and taking a one-seat ride for the other half. My personal opinion is not that the poor handling of such trips is a failure of transit, but rather that there are certain types of trips that transit is optimized for and short L-shaped trips isn’t one of them. Short L-shaped trips are simply better accomplished by some other means, such as walking, jogging, skateboarding, bicycling, or even riding a taxi, while longer trips, especially trips in a straight line, allow transit to work more efficiently. If anybody else has opinions on the matter, I look forward to hearing them! The other day, I ran into a concrete example of the short L-shaped trip. Accompanied to two parents, we were trying to go from the Pearl District to the Oregon Museum of Science and Industry, across downtown. The entire trip was about 1.9 miles each way, but for reasons described above, the transit system could spare our feet from some walking, but couldn’t really save us a non-trivial amount of time over walking. This, in spite of the fact that were were in the downtown of one of the best transit cities in the U.S.
After much discussion, we decided to walk the 1.9 miles to the museum along downtown streets and Riverfront Park, with a plan to either walk back or call a taxi, depending on how tired we were. In the end, we accomplished the entire 3.8 mile round trip on foot. Make your own life more simple get the home loans and everything you want.